NYK has signed a contract with Hanjin Heavy Industries & Construction Co. Ltd. in Korea to build the world’s first LNG bunkering vessel built for the purpose of providing LNG to LNG-fueled vessels. In a joint initiative to develop a global market for the LNG bunkering business, NYK concluded a framework agreement with GDF SUEZ S.A and Mitsubishi Corporation on May 13, 2014. As the first project under this initiative, GDF SUEZ, Mitsubishi Corporation, and NYK have agreed to construct an LNG bunkering vessel to form the core infrastructure for this business, enabling distribution of LNG fuel in the European maritime region. The vessel will be delivered in 2016, and will be based at the port of Zeebrugge, Belgium. The vessel will deliver LNG to LNG-fueled vessels operating mainly in the North Sea and the Baltic Sea. With increased emission regulations, demand for LNG as a fuel is growing in the seas around Europe. This LNG supply and sales business will initially be targeted at LNG-fueled car carriers operated by United European Car Carriers (head office: Oslo, Norway), as announced by NYK in March 2014, as well as other LNG-fueled vessels operating in the North Sea and the Baltic Sea. In Northern Europe, about 50 LNG-fueled vessels — most of which are ferries, cruise ships, and offshore related vessels — are already in operation. Toward meeting international efforts to control emissions1 from ships, LNG-fueled vessels are widely seen as an important countermeasure for reducing harmful emissions and thus mitigating any environmental impact. With respect to sales, the current bunker market accounts for approximately 250 million tons of heavy fuel oil per annum. As more and more vessels shift from marine fuel to LNG fuel, heightened demand for maritime LNG supply is expected. To support the increasing number of LNG-fueled vessels in operation, the challenge is to develop and improve the supply infrastructure. LNG bunkering vessels can access and supply a variety of customers across a wide maritime area, and they can do so more promptly and efficiently than can LNG supply facilities on land. Thus, LNG-fuel sales are expected to thrive. GDF SUEZ is a charterer and co-owner of NYK’s LNG carriers. With Mitsubishi Corporation, NYK has established a relationship in both the LNG carrier business and the Cameron LNG project, representing upstream interests in the LNG value chain. Taking further advantage of these partnerships, GDF SUEZ, Mitsubishi Corporation, and NYK intend to establish a company to own the LNG bunkering vessel, as well as an LNG-fuel sales company, which will charter the vessel, to build a solid sales framework in Europe. In the future, the joint venture aims to expand its business globally. The NYK Group has been promoting practical use of environment-friendly LNG fuel by constructing the world’s first LNG-fueled car carriers and Japan’s first LNG-fueled tugboat. 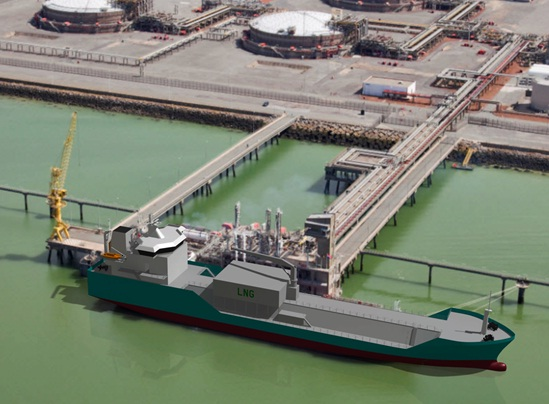 The new LNG bunkering vessel is part of the Group’s new “More Than Shipping 2018” medium-term management plan. By participating in the supply of marine fuel, NYK will further contribute to a more widespread use of LNG fuel in order to maintain a healthy environment. The requirements applicable to ships for controlling NOx, SOx, and CO2 emissions are getting stricter every year. In particular, regulations aimed at reducing SOx emissions by vessels are becoming ever more stringent. A proposal by the International Maritime Organization (IMO) in 2010 was adopted to lower emissions. Thus, emission limits applicable will be reduced from the current 1.0% to 0.1% in 2015 in certain Emission Control Areas, or ECAs (the North Sea, the Baltic Sea area, and areas around North America). Outside of the ECAs, emission limits will be reduced from the current limit of 3.5% to 0.5% in 2020 or 2025 (a measure will be adopted in 2018). Use of LNG almost completely eliminates SOx and particulate matter (PM) emissions, and the operation of LNG-fueled vessels can result in a reduction of nearly all SOx and PM emissions compared to emissions by vessels powered with conventional heavy fuel oil. LNG use can also reduce CO2 emissions by approximately 30% and can reduce NOx emissions by up to 80%. The widespread adoption of LNG is thus considered an influential countermeasure for controlling greenhouse gas emissions by ships.